Fleas, cat flea (Ctenocephalides felis) and dog flea (Ctenocephalides canis), are external parasites, which feed on animal and human blood. 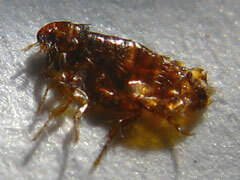 Fleas can jump huge distances in relation to its size and the adult can move rapidly among pet hair and carpet fibres. Development is 8-150 days depending on temperature but usually 2-3 weeks. Appearance: 2-3 mm long and brown in colour, eggs are 0.5 mm long oval and pearly white. Lay 4-8 eggs after blood meal, 1000 in lifetime. Eggs hatch after 10 days, with the larva 1.5mm long and threadlike. Habitat; Often around pets and their bedding, will often remain in premises after the pets have vacated the building.